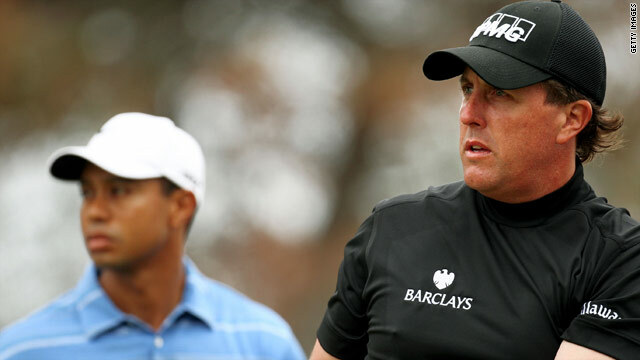 Phil Mickelson (right) could leave Tiger Woods in the shade at the The Players Championship in Florida. (CNN) -- It is a record that has held firm for 258 weeks but Tiger Woods' reign as the world's best golfer could be nearing an end. That's because his nearest rival Phil Mickelson can leapfrog Woods to the top of the world rankings for the first time in his illustrious career with the right result at the The Players Championship (TPC) at Sawgrass this coming weekend. Woods ended his five-month exile from the game at the U.S. Masters at Augusta in April following the scandal over his admitted marital infidelities, but at the recent Quail Hollow Championship he missed the halfway cut for only the sixth time in 14 years as a professional. Mickelson has been in good form, winning the Masters before finishing second at Quail Hollow. If he triumphs at Sawgrass and Woods finishes outside the top five, Mickelson will claim the coveted spot. "I'm glad that this first tournament went well, because after a couple weeks off after a big high like Augusta, you never know where the game is going to be at," Mickelson was quoted as saying in a story on the PGA.com Web site after clinching second place at Quail Hollow with a 15-foot birdie putt on the final hole. "And the way that I played and kept the ball in play and hit good shots, I'm looking forward to next week." Woods stopped short of blaming media intrusion on his failure to make the cut in North Carolina but said it was definitely affecting his game: "Well, I get asked every day. Every day I do media, I get asked it, so it doesn't go away. Even when I'm at home, paparazzi still follow us, helicopters still hover around," Woods told reporters in quotes carried by his personal Web site. Woods, who has already arrived at the course to begin his preparations for the event, won TPC Sawgrass in 2001 and finished eighth last year while Mickelson clinched the title in 2007. One thing is certain, with the title of world's best golfer at stake, the stage is set for another fascinating chapter in the long-running battle between two of the game's greatest rivals.